To ensure a better game experience, we are performing an update from Apr. 10th 2:00 to Apr. 10th 5:00 EST. During this time you will not be able to log in. The duration time is an estimate and may be extended due to technical issues. We really appreciate your patience and understanding. 1. Onmyoji x Hozuki's Coolheadedness LAST Crossover! - Summon to acquire Crossover Character shards! During the event, summon with Mystery Amulets, Jade, or AR Amulets for a chance to get SSR character Hozuki or SR character Oko shards. Collect 50 Hozuki shards or 40 Oko shards to obtain the corresponding limited crossover character! - SP/SSR Chance Up Again! Note: Once the player has summoned an SP or SSR Shikigami, the summon chance will revert back to normal. - Discover the Hozuki Demon Seal! During the event, players who clear the Exploration Zone will have a chance to encounter the Hozuki Demon Seal. Clear the demon seal for a chance to obtain Hozuki shards or Hozuki "Hell Celebration" skin shards! - Hozuki skin on sale in the skin shop! After the update on April 10th, Hozuki's "Hell Celebration" skin will become available in the skin shop! Collect the corresponding skin shards to redeem it! After the update on April 10th - before the update on April 17th, limited R character Peach Maki & Karashi can be redeemed with Talismans from the shrine an unlimited number of times. Players will also have a chance to purchase skin shards of Oko and Peach Maki & Karashi from the merchant on the Explore map. Collect 50 skin shards to redeem the skin from the skin shop. - Hozuki and Oko can only be obtained by collecting shards. Peach Maki & Karashi can only be obtained from the Shrine. These characters cannot be obtained directly from summoning. - Players Lvl 40 or above can wish for and donate Hozuki and Oko shards in the guild interface. - Players Lvl 15 or above can obtain Hozuki and Oko shards when summoning. - Hozuki, Oko and Peach Maki & Karashi does not count towards the Shikigami list under Collection. - The appearance rate for Hozuki shards and Oko shards via summoning are individually calculated and do not affect one another. - Event details will be added to the summon interface for players to confirm with ease. 2. Collect shards for Hozuki's limited skin! - Obtain Hozuki's "Hell Celebration" skin shards from Assembly Bosses in Demon Encounter, or clearing Hozuki's Demon Seal. - Players can also purchase Hozuki's skin shards in the General Shop. - Collect 50 "Hell Celebration" skin shards to redeem the limited skin from the skin shop. Redeem "Hell Celebration" within the event time to earn extra bonuses! 3. Hozuki’s Side Chapter: "Visitors from Afar"! 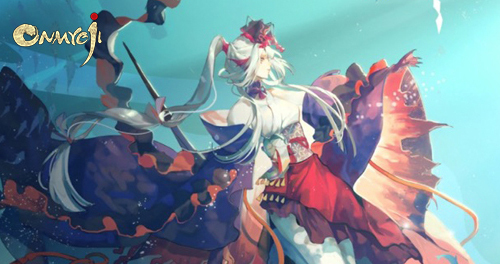 After the update on April 10th, the last Onmyoji X Hozuki’s Coolheadedness Crossover Event is coming, and a new side chapter “Visitors From Afar” will be added to “Heian Tales”! As a special guest, Hakutaku from Hozuki’s Coolheadedness will also make an appearance in this side chapter! Please note that "Visitors From Afar" is only accessible by players who have summoned Hozuki. This access cannot be shared with others even if their bond level has reached companion at the request of the copyrights owner. During the event, players can access the event zone from the Map, and win battles to receive rewards! Additionally, clear specific conditions to earn bonus rewards! Event rewards include "Sakura Fest Mark", which can be used to redeem items in the event shop, including Sakura’s skin "Hanami Lady"! This skin can also be obtained in the skin shop. *If players already possess "Hanami Lady", and redeem this skin from the event shop, they will receive Skin Tokens of equal value instead. After the event shop closes, all unused "Sakura Fest Mark" will become void. Please redeem the rewards before the event ends. 5. New Skins on Sale! Juzu's new skin "Mochi Maker" and Yamausagi's new skin "Melodic Samurai" will be available for purchase in the Skin Store after the update on Apr. 10th. They will be 20% off for the first week, so don’t miss out! 6. New Feature: Nameplate for Guild is Online! Every guild can create its own nameplate! The leader of the guild can introduce the guild by uploading an image and writing a brief introduction on the nameplate. The others in the guild can share the nameplate to let other Onmyoji know more about their guild. Besides, the nameplate can be also used for finding a guild, recruiting guild members, merging guilds and guild ranking. Come to try this nameplate! 7. Multi-Language Support(Beta) is Now Available! After the update on April 10th, the multi-language support function(Beta) will officially meet everyone! For any players, you can easily change the language in the setting panel. Please note, you will have to restart the game if you change the language option. At this moment, we currently support English, Chinese(Traditional), French, German, Russian, Spanish, Portuguese and Thai. And since this function is still in Beta test, we currently only localize the text of main interface, courtyards, town and most of the main chapters. We sincerely hope that everyone could have fun and be able to make friends in Onmyoji Global, enjoy those fantasy Heian tales while playing it, so that’s why we love hearing from your opinions and finally decide to start this work. In the future we will keep updating this function, if you have any bug reports or optimization suggestions for this testing function, please don’t hesitate to give our customer service feedback with the “Localization” tag. 1. Fixed an issue that occurred when Medicine Seller used his Defense skill, where the damage dealt with targets with Revealed could be shared by Hakuzosu's Shadowing Shelter skill. 2. Fixed issue where the damage dealt with targets with Isolation could still be shared. 3. Fixed issue where the effect of the Soul Fortune Cat could be triggered by some battle actions when it wasn't supposed to. 4. Fixed an issue that caused the effect of the Soul Scarlet to be triggered when a Shikigami equipped with the Soul set is revived by Hiyoribou after being KO'd by a multi-strike attack. 5. Improved Kagura's Summon: Afterlife. A Shikigami affected by the skill can now become a ghost normally when KO'd by reflected damage from the effect of the Soul Mirror Lady. Deals an extra 20% damage when landing a critical hit, but inflicts Empowering Flow (Reduces DEF by 20%. Whenever he deals damage, if the target has higher DEF, the damage dealt ignores 50% of the DEF difference.) lasting 1 turn on himself. Forms water into a shoal of fish that inflicts a 2-strike attack on 1 enemy, dealing damage equal to 53% of his ATK with a 100% base chance of inflicting Isolation lasting 2 turns on them on the first strike, and dealing damage equal to 211% of his ATK on the second strike. Damage taken cannot be shared by other effects, including Shouzu\'s skill Water Circuit and Soul Edge\'s effect, among others. The first strike dispels 1-2 random buffs from the enemy. Each buff dispelled increases the damage of the second strike by 5%. Lv. 2: Increases damage of the second strike to 226%. Lv. 3: Increases damage of the second strike to 241%. Lv. 4: Increases damage of the second strike to 256%. Lv. 5: Increases damage of the second strike to 270%. ※ Improvements made to Lord Arakawa in this update do not affect the skill effects of Lord Arakawa as a monster. Kaoru's skills have been extensively revamped with new mechanics added. Viciously flings a stone at one enemy, dealing damage equal to 100% of her ATK. Lv. 2: Increases damage to 105%. Lv. 3: Increases damage to 110%. Lv. 4: Increases damage to 115%. Lv. 5: Additionally lowers the Move Bar of the target by 15% if the target has 4 or more buffs. At the beginning of each turn (either ally\'s or enemy\'s), a status change triggers, changing her status to either Play or Alert. Kaoru usually stays in Play status. If 2 of her allies are under controlling effects, Kaoru\'s status will be changed to Alert. Play status: Kaoru is usually in Play status. Alert status: Increases SPD by 10 and Effect RES by 40%. Lv. 2: When she\'s in Alert status, increases the Effect RES boost effect to 50%. Lv. 3: When she\'s in Alert status, increases the Effect RES boost effect to 60%. Lv. 4: When she\'s in Alert status, increases the SPD boost effect to 15. Lv. 5: If she\'s in Play status, at the end of her turn, increases all damage dealt by allies by 10% until her status changes. Spends 30% of her current HP to grant Owl\'s Protection to an ally. Sustainable for 1 turn. Dispels a debuff or controlling effect from each of her allies. If Kaoru is in Alert status, allies under controlling effects gain Owl\'s Dance for 2 turns. Otherwise, gains 4 orbs. Owl\'s Protection: When taking damage, absorbs and records all damage taken. When the mark fails, causes the ally to lose HP by 80% of the amount recorded. Owl\'s Dance: Increases SPD by 50. Lv. 2: When Owl\'s Protection fails, causes the ally to lose HP by 70% of the amount recorded. Lv. 3: Reduces orbs required by 1. Lv. 4: When Owl\'s Protection fails, causes the ally to lose HP by 60% of the amount recorded. Lv. 5: Upper Hand: Grants Owl\'s Protection to the ally with the lowest HP. Sustainable for 1 turn. 1. Added a "Feed now" feature to Gluttony Ghoul. Players can tap the "Feed now" button on the Gluttony Ghoul's Eating Habit settings page to feed it all the abandoned Souls that match the Eating Habit settings, exchanging them for stored Soul EXP. 2. Adjusted the Upper Hand skill effects of all Shikigami. The skill-casting animations and the resolution of the skill effects will no longer take turns. They will take effect at the same time and no longer count as taking an action. 3. Added a prompt on the map indicating the Area Bosses newly unlocked the previous day. Players can tap the New button at the top right of the Area Boss page to quickly check and challenge the unlocked Area Bosses. 4. Adjusted the skill-casting duration of all models of Ibaraki Doji based on Ibaraki Doji's Demon Hand skin. 5. Players who are banned from posting comments can no longer share their grade 6 Shikigami at max level, max level Souls, or Chronicle pages with any chat channel or any of their friends.